Designed for elite operators on the go was the intent behind the Original SWAT H.A.W.K. 9in Waterproof Boot 162033. 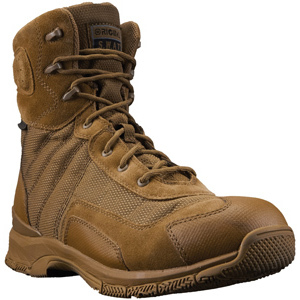 This lightweight coyote tan boot meets the EN ISO 20347 standard for occupational footwear with fuel oil resistance with excellent slip resistance. This boot is designed for wet conditions with protection from HydroGuard waterproof full bootie construction. This boot is always easily ready for an inspection with a polishable leather and durable nylon mesh upper. For performance and comfort in the field, a lightweight molded dual density EVA midsole provides a shock absorption zone for maximum comfort and fatigue control. For personnel that spend continous hours on their feet, an exclusive airport-friendly Flex-Lite molded nylon stability board provides additional footbed support while giving lightweight, flexible support and performance.